Collision coverage on your car insurance policy will repair damages to your vehicle when something collides with your vehicle. In most states, the coverage only applies when you are at-fault in an accident or do not know who caused the damage created by another vehicle. Collision coverage covers your vehicle only, not anyone else's. What Qualifies as a Collision? If your vehicle is in an accident with another vehicle, you are in a collision. Collision coverage will apply to at least one of the vehicles involved. If collision coverage was not selected by the at-fault driver, he or she will not have coverage to repair their vehicle. Because potholes are oftentimes avoidable, insurance carriers treat pothole damage as a collision. Collision coverage must be selected in order for repairs to the vehicle to be covered. Hitting a tree can do severe damage to a vehicle. It makes a difference how the damage occurred. A falling tree is considered a comprehensive claim. Hitting a standing tree or even a tree which fell prior to you hitting it is considered a collision. To put it simply, hitting an inanimate object is considered a collision. Slamming into or even barely scraping by a guardrail, stop sign, mailbox, or building would all be considered a collision. It makes no difference if the damage is a small scrape or a crushing blow, contact with an inanimate object resulting in damage to your vehicle is a collision. Sometimes landing in a ditch can cause considerable damage to your vehicle. Earth being shoved up into the undercarriage of your vehicle can quickly require a trip to a mechanic. Rolled vehicles even more so. Physical damage all over the vehicle not from a comprehensive coverage peril will always be covered under the collision coverage. 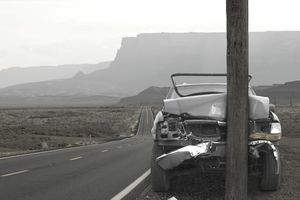 Assuming you have collision coverage, the insurance company has two options for making you whole again. Your vehicle will either be repaired or the actual cash value of your vehicle will be paid out in the case of a total loss. Aftermarket parts or used parts will be used to repair your vehicle. In order to get OEM parts, you will of had to of selected an additional endorsement to your policy, which only some insurance carriers offer. The repairs to your vehicle should return your vehicle to its previous condition as if the damage never happened. If your vehicle is a total loss, an insurance claim adjuster will coordinate with you to determine what the actual cash value of your vehicle was at the time of loss. Any recent repairs or part replacements should be factored into the actual cash value. Find receipts for any recent car repairs you have had done. Collision coverage usually comes with a deductible. You will be responsible for paying the dollar amount listed on your collision deductible. The deductible is set up at the time you add your vehicle to your car insurance policy. Sometimes the fault is not cut and dry in a collision. It is possible to have both parties involved insisting they were not at fault. In this type of situation, you can file a claim under your collision coverage and have your insurance company work on subrogating for you. Subrogation means you try and get reimbursed for a claim after fault is determined. It allows you to get your vehicle repaired in a faster time frame and get reimbursed at a later time. The reimbursement can wash away your at-fault claim status. Your insurance company is ethically required to help subrogate a claim for you, however, they are not required by law. A collision can happen to anyone. As a driver, you are taking on the risk of a possible collision. Michigan drivers have a different set of collision rules to follow according to Michigan no-fault insurance. However no matter what state you reside, if you are in an at-fault collision, you need collision coverage selected on your car insurance policy in order to have your vehicle either repaired or totaled out.